A nest is a place to rest in comfort and safety. Decorate your nest with this four inch by four inch handmade tile featuring a bird's nest containing three eggs. It makes a good companion to any 4"x4" bird tile. Is four inches too big for your project? It is also available in the 2"x2" size. With proper care, this tile may last thousands of years! The nest handmade tile can be installed in kitchens, bathrooms, showers and more. It is made by hand in the Arts and Crafts tradition, and makes a great wall hanging (no frame is required- it is ready to hang.) Made from a stoneware clay body. 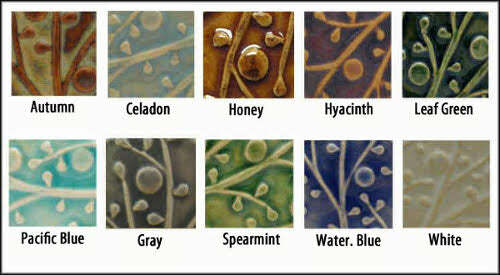 Choose from a set of unique glazes, all lead-free and non-toxic.